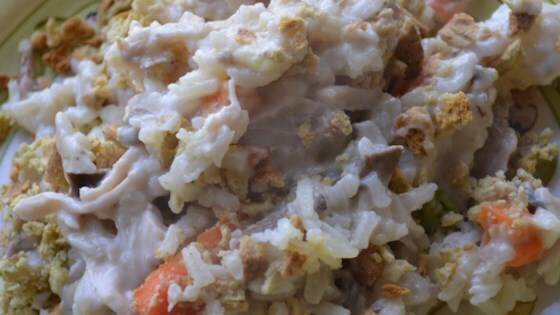 "One of my husband's favorites for leftover turkey. Perfect for eating leftover turkey after the holidays." Mix cream of mushroom soup, water, turkey, wild rice, milk, and onion together in a 2-quart casserole dish. Cover dish with aluminum foil. Bake in the preheated oven for 50 minutes. Remove foil and cook until rice is tender and liquid is absorbed, 10 to 15 minutes more. Very bland should of read reviews before i made it and added something to spice it up. I made it as written, and it was good.